Following last month’s release of Young Bruce Lee, Cine Asia is releasing another 2 disc DVD later this month, Detective Dee and the Mystery of the Phantom Flame. Produced by the Huayi Brothers and directed by Hark Tsui – with action sequences staged by Sammo Hung Kam-bo – the film won six awards at the 30th Hong Kong Film Awards in April: Best Director, Best Actress, Best Art Direction, Best Visual Effects, Best Costume and Make-up Design, and Best Sound Design. Set in 689 A.D. Tang dynasty China, a mysterious series of deaths begin to occur a short time before the official coronation ceremony of China’s first female emperor (Carina Lau). Fearing clansmen and government officials are conspiring against her, Empress Wu reluctantly recruits master detective Dee (Andy Lau), who was disgraced and imprisoned years earlier for speaking out against her reign. Dee is presided over by the Empress’s retainer, Shangguan Jing’er (Li Bingbing) and Pei Donglai (Chao Deng), an assistant to one of the victims in the film’s opening act. Dee rejects an offer to join forces with General Li Xiao (Yao Lu) to usurp the Empress, and maintains a focus on the mission given him, even when he and others working with him come under increasing threat, and even as he himself comes under suspicion to be working against his new employer. Modestly budgeted at an estimated $13 million, Detective Dee is at first an economic epic grounded in a general if not detailed history; its eponymous hero is based loosely on the real-life Tang dynasty judge, Di Renjie, though here his martial arts prowess is exaggerated and aestheticised: in the role, Andy Lau returns to the kind of action set-pieces familiar to audiences of House of Flying Daggers. Jialu Zhang‘s script combines traditional murder mystery elements with martial arts scenes well, though as the film develops its character relationships – interesting because they represent conflicting political interests – become more romanticised and less nuanced, as the film itself becomes more invested in fight sequences. Tsui’s direction makes the early exposition navigable and keeps things moving; green screen is used effectively and the CGI – particularly early on – gives an impressive rendition of Luoyang, the then Chinese capital. Visually, the film is most enthralling in daytime and exterior sequences; it’s a shame that its climactic showdown takes place largely in darkened interiors. Cine Asia’s 2 disc release includes a 2.0 and 5.1 Dolby Digital soundtrack, though its subtitles are sometimes too rapid. The film’s visual blend of location shooting and hyperreal CGI – sumptuous or irritating depending on taste – is presented well in its 2.35:1 aspect ratio. There’s a trailer gallery for other Cine Asia releases and an interview gallery of Detective Dee‘s principal cast and crew (director and action director, art director James Choo and both cinematographers, Chi Ying Chan and Chore Keung Chan). These latter interviews are mostly unimaginative snippets of mutual congratulation; likewise, there’s a 16-minute “behind the scenes” featurette that offers a snapshot montage of the crew at work. More insightful is the film’s audio commentary by respected East Asian cinema expert Bey Logan, who provides a balance between useful context and personal opinion. As Logan notes towards the end of the film, the full English title of Detective Dee hints at an Indiana Jones-style franchise, which wouldn’t do any harm at all. 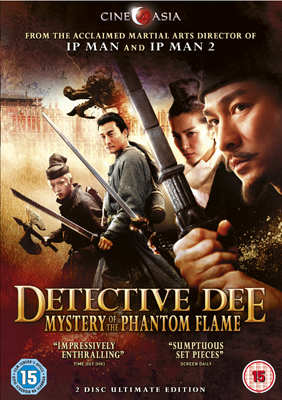 Detective Dee and the Mystery of the Phantom Flame is released on DVD and Blu-Ray on June 27.